Microsoft CEO takes jab at Android | Android Blast! Microsoft CEO Steve Ballmer recently gave a talk at the Microsoft Public Sector CIO Summit. 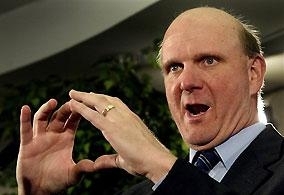 After being asked a question about how Windows Mobile could compete with Android and the iPhone, Ballmer took a shot at Android. "With that said, we did sell more Windows Mobile devices last year than Apple did iPhones - just an important factoid to have. Blackberry was a little bit ahead, and Google was nowhere to be seen, except in Silicon Valley, I'm sure. But we'll do our best to help you with that challenge."